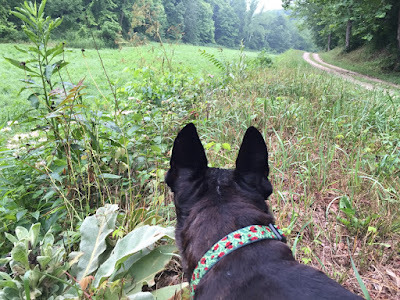 In mid-July, I made a series of runs down Dean’s, full of joy that my little buddy Chet feels up for adventure again, and leads me at a smart trot, going and coming. 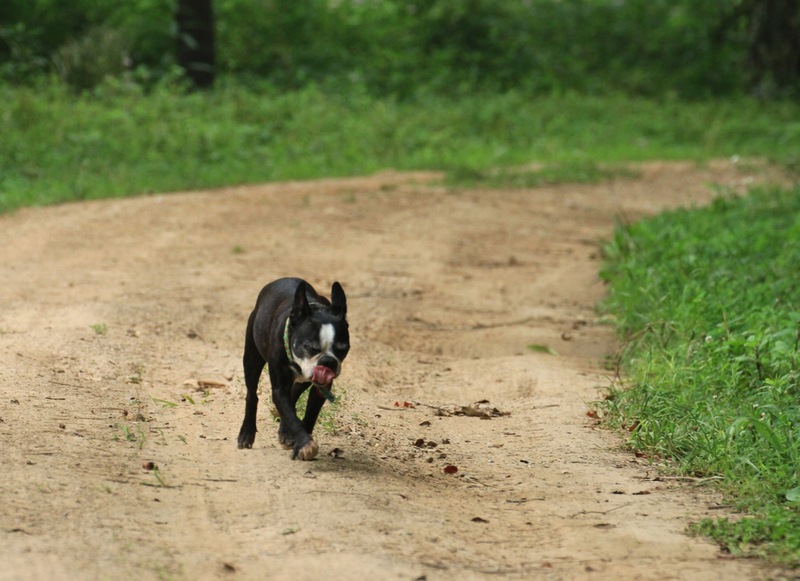 He's found something delicious in the weeds, and is hurrying to catch back up. 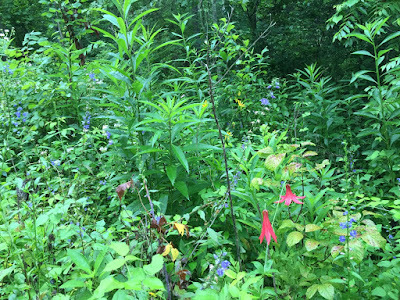 July 16 was a cloudy, flat day, but the Canada lilies were abloom with their surprising red amidst blue washes of bellflower. Egad what a gulp of a flower! I can't spot one without emitting a squeal of delight. Wild bergamot’s turpentiney scent hung heavy in the thick air. A small, short-tailed warbler flitting madly through the mid-canopy proved to be a juvenile cerulean, who came down to eye-level and chipped at me. 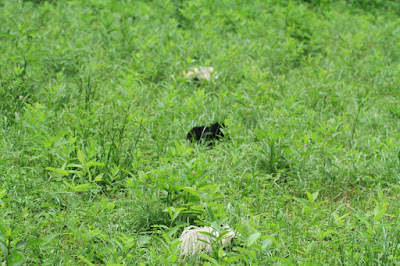 Of course, I had no camera rig that could capture her, but here's a photo from July 25, 2010, right in our yard. Such a gorgeous plumage the fall immature cerulean sports!! 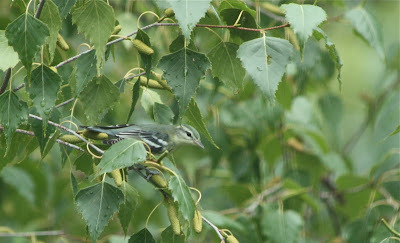 It's a blue-green I've seen on no other warbler, save perhaps a young male black-throated blue. 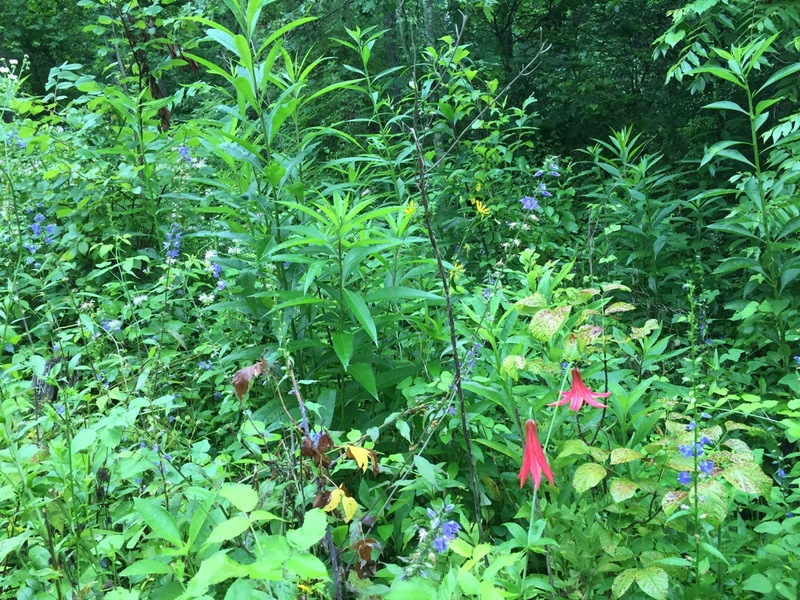 nor could I do anything with the pair of indigo buntings who sidestepped up the Joe-Pye weed stems, spitting their alarm calls at me. 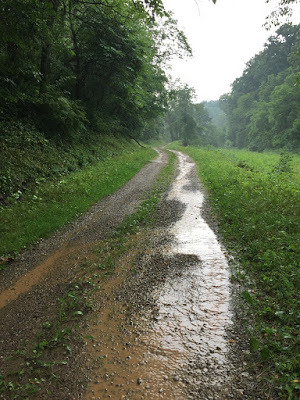 Down near the end of the road, where it meets blacktop, a yellow-billed cuckoo called and landed just overhead. It dropped its bright rufous primaries, hiked its tail, and a male cuckoo swooped in and answered the invitation with a quick copulatory flurry of wings. Well! Knowing how brief the nesting cycle of cuckoos is—only 17 days from egg-laying to fledging of the chicks—a mid-July mating didn’t seem so strange. But it was a delightful surprise. My late momma Ida throws cuckoos and thrashers at me. I smiled and nodded in acknowledgement. Message received! Also a delightful surprise was the skunk I found rooting around in a long strip of meadow. 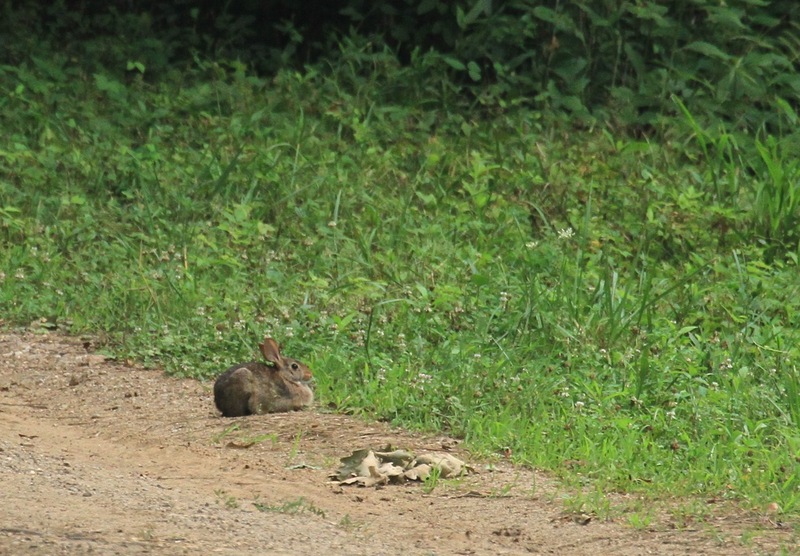 Mostly white with a black undercarriage, it foraged as if it hadn’t a care in the world. Skunks seem not to worry what might be going on around them; they’re so heavily armed that they can handle whatever might come. This gives them a demeanor that recalls Mr. Magoo—nearsighted, slightly bumbling, and utterly endearing. They are among my favorite mammals. I took note of the time: 6:45 AM, and resolved to return with my big camera to try to catch him again. 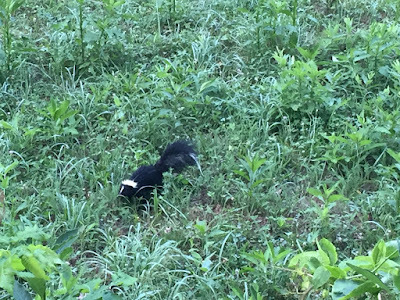 Cellphone photos of skunks: not so good. This is the best I could do with my cellphone on my second try at skunks. 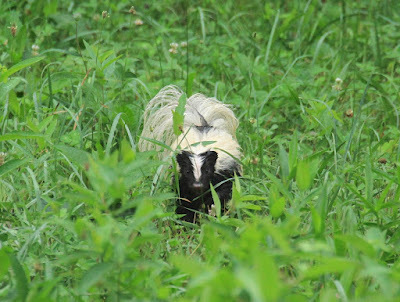 I was breathtakingly close to the black skunk, so close that when he disappeared into vegetation just below the bank I was sitting on, I quietly arose and trotted away. 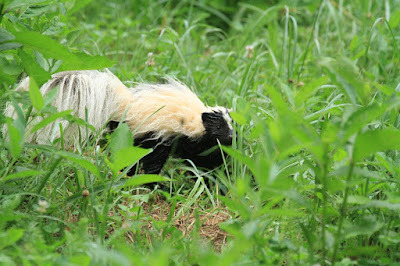 I did NOT want that skunk to pop out of the tangle right at my feet! Two days later, I returned, running shoes traded in for hiking boots, my 6-pound Canon 7D and 70-300mm telephoto on my shoulder. I was astounded to find not one but three striped skunks foraging in the same meadow. Persistence, richly rewarded. 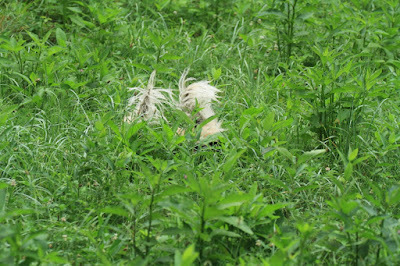 The grass was wet from the night’s rain, and so was their fur, arranged in wild dreadlocks by the dew. Foraging must have been good, for the three barely looked up, and they came so close I could hear them snorting and chewing beetle grubs and whatever else they were digging out. One got a seed hull or bug down his windpipe, and the little animal began wheezing, and I laughed as I found myself instinctively wanting to run to it to cover its nostrils like I do for Chet Baker when he gets the wheezles. That gesture might not be understood or appreciated, and I’d likely come out of my mission of mercy howling in agony and smelling of burnt tires and garlic. I have been sprayed by a skunk once, been really near Chet when he got sprayed once, and those two instances are quite enough. I never smell skunk perfume without marveling that such a beautiful little creature can produce such a powerful odor. How in the world do they even do it? How can they concentrate chemical compounds in their little glands that can be smelled for miles and miles?? Surely this is one of the great wonders of the world. 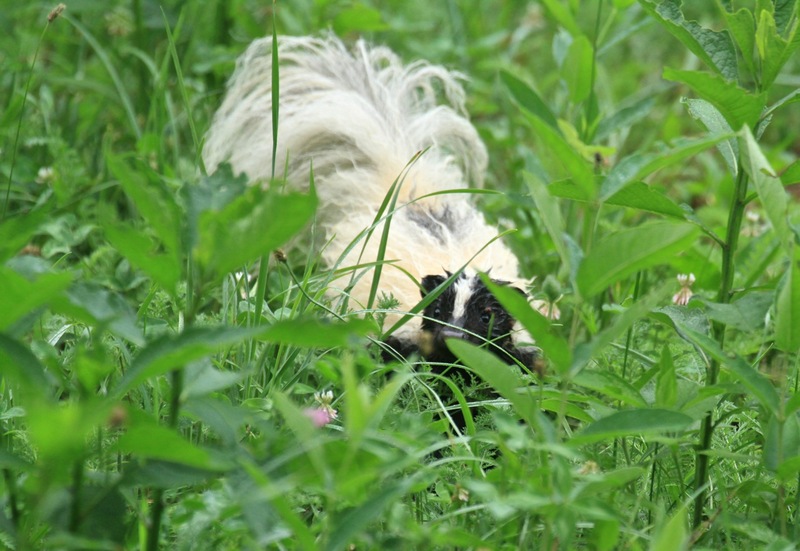 Skunks are difficult to connect with in a photograph because their heads are almost always down. When they came near, I’d squeak like a mouse to get them to raise their heads. Their hearing is excellent, and their eyesight is probably fine, too. They’d briefly look me dead in the eye and go on with their business. Their look seemed to say, “You again. Shut up. 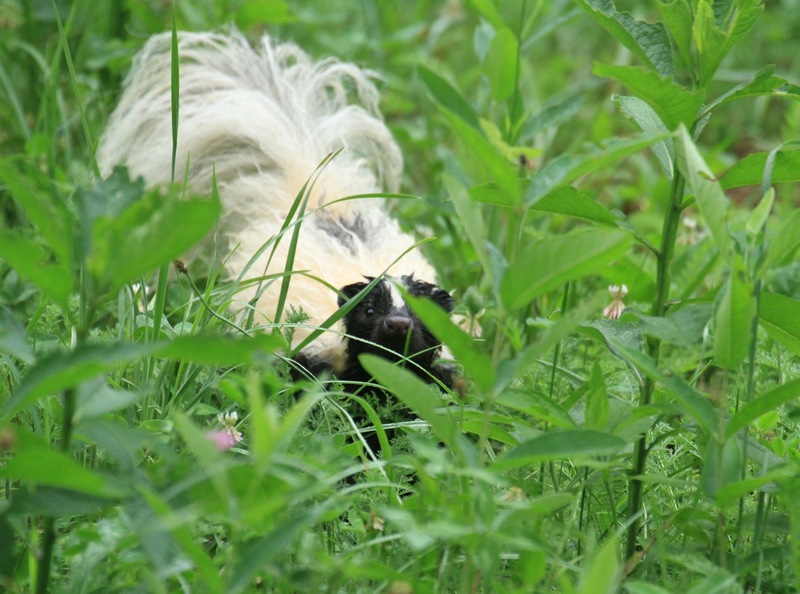 I’m working here.” Skunks have that weasel toughness, and they project confidence, or at the very least, unconcern. You give them room. You watch them, try to predict where they’re headed, and get out of their way if it’s toward you. You might at this point be wondering where Chet Baker was. 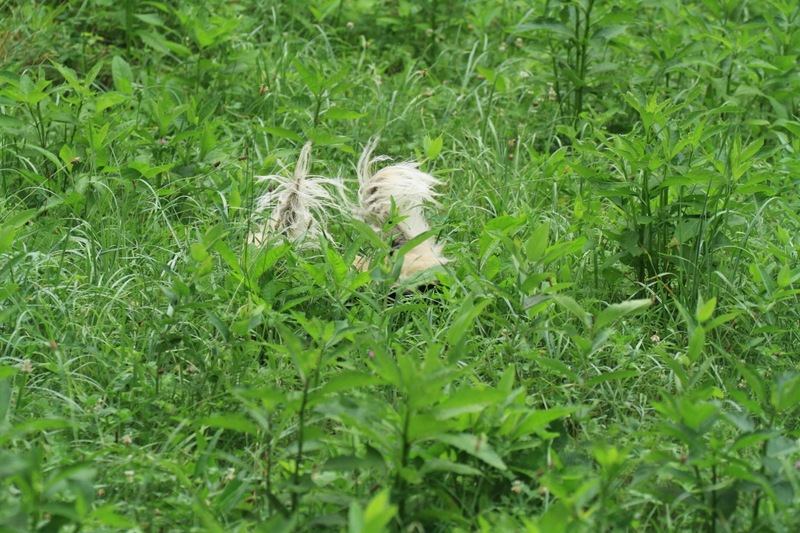 He was right beside me, watching skunks, too. The beauty and wisdom of a mature dog. No barking. No fussing. No whining. 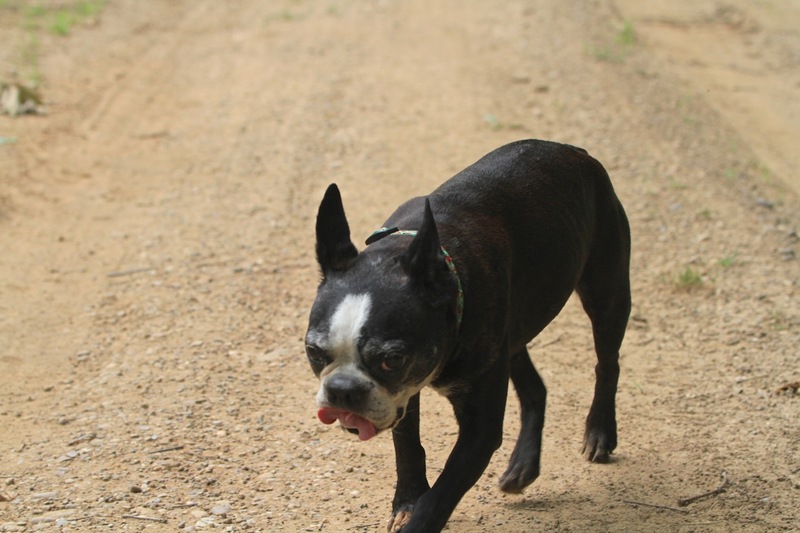 No pulling at the (nonexistent) leash. He gets it, without words being passed between us. Those are skunks. I've seen those before. We don't mess with those. We just sit quietly and watch them. I often say that Chet's no brain surgeon, no wonder dog, but he's plenty smart enough for me. And I never appreciate that fact more than in a situation like this, where one false move by an excitable dog could ruin the photo salon, not to mention my clothes and equipment. Chet's my partner in the buddy movie of life. Three skunks in alignment. That's a hard shot to get, my friends. I was highly amused to see two skunks come closer and closer together and finally contact one another, simply by running into each other. Tails whip straight up and wave around. I imagine there's some fancy stompy footwork going on, some communication I can't divine going down. 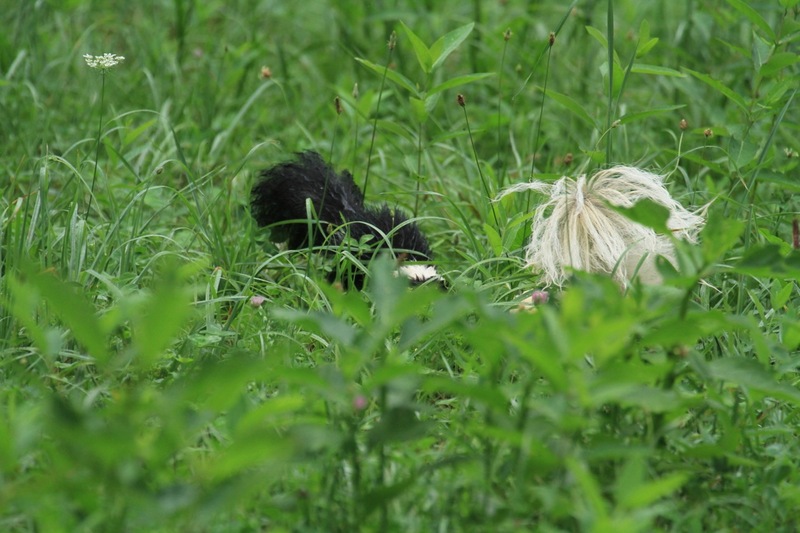 I don't know what information was exchanged, but in both encounters (between the black and white skunks, and the two white-backed skunks) the animals seemed to touch noses and go separate ways without a snarl or scuffle. 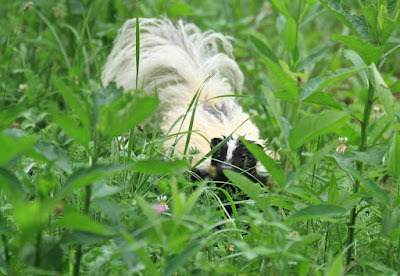 I absolutely adore skunks. I'd love to know them better. 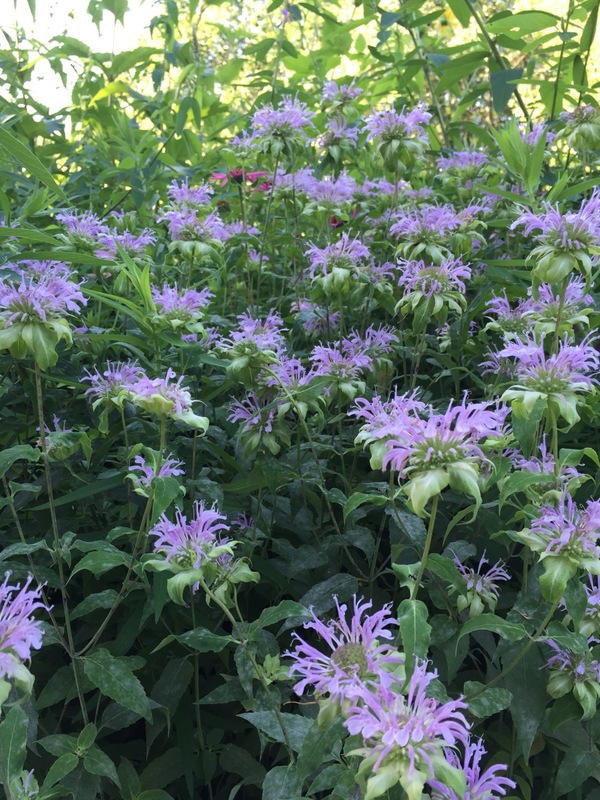 For me, they're an infrequent treat, a scent wafting on the night air in early spring. I've always wanted to raise a little batch of 'em, if Fate would permit it. I've got my rabies shots; I've got my permits. I've sent my request out to the Universe. We'll see what happens. For now, visiting these 6:45 AM beauties is more than enough. Such riches, to be able to go see skunks when I want to! Because the Gods know when you're a mile from your car with your big camera rig and no raincoat, they unleashed a downpour when I was on my way back up the Fork. Just a little test of ingenuity for Zick. Let's see what she does. I laughed, stripped off my shirt, wrapped the camera in it, and cradled it against my stomach, my body hunched over, and loped toward the car. 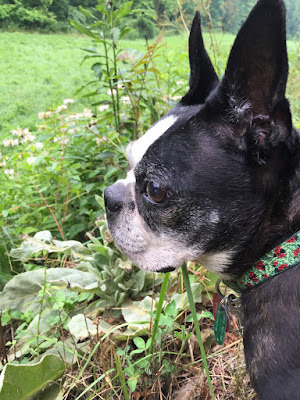 Chet put on his rain ears, laid back flat against his neck. I got to the car with a dry rig, and a slight crick in my back. Body as rainshield, for 1.3 miles. It can be done. The bacon is smart. I have 7 terriers and not a one of them would have enough sense to leave a skunk alone. Another great post, covering all my favorite things. 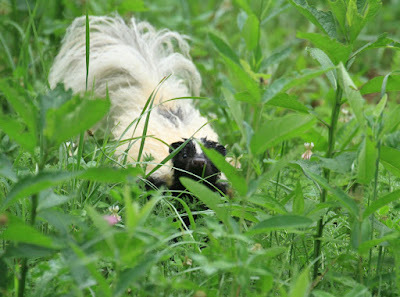 I love skunks but once one almost gave me a heart attack. 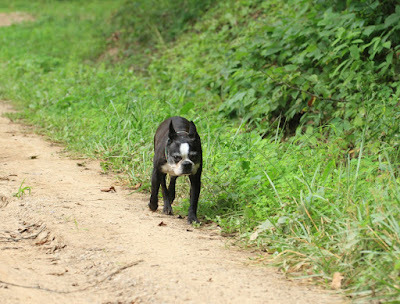 I was walking with my daughter's black lab who was off leash and enjoying sniffing through the roadside meadow. Suddenly JD, the lab and I saw a skunk coming towards us. 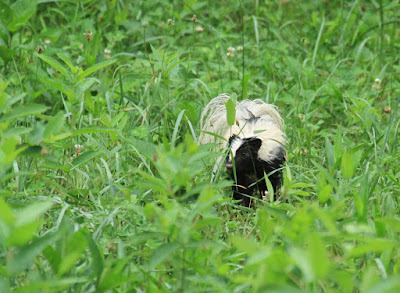 JD trotted over and the skunk stopped and then they touched noses. 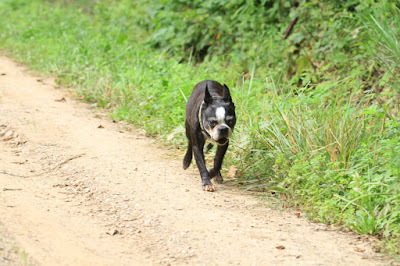 Finally JD condescended to come and the skunt continued on his own walk. Delightful post! Have you ever seen some of the documentaries about skunks on PBS? They truly are fascinating creatures. I gained a whole new respect and interest in them from watching those. 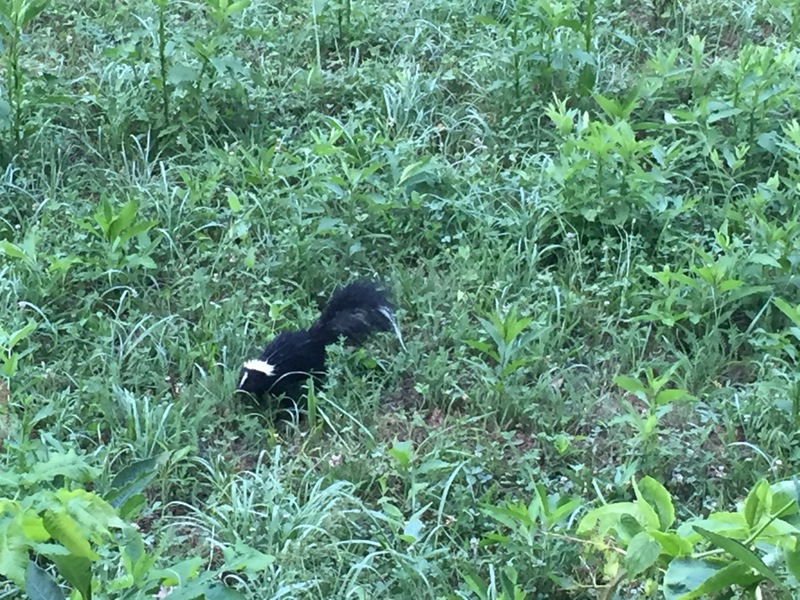 I don't live in the country, but we have skunks occasionally in my neighborhood. Never see them, but sure have smelled them! I ran out the door one night last week yelling and clapping my hands to scare off the raccoons. Wasn't raccoons, but 4 baby skunks. The waddled off rolling over one another to get away from the loud human.So cute.